Dan Zhang & Hao Zhang hold a 0.60 point lead over their countryman Qing Pnag & Jian Tong after the Short Program. Dan Zhang, who took a nasty fall during the Olympic competition skated in a bandage on her left knee. "I feel much better now that at the Olympics," she said. "The cross ligaments and inside ligaments in the knee were affected. I still have to stabilize the knee (with a bandage)." Zhang & Zhang skated a clean program, which was well skated, with all their signature moves, such as the double twist, well done. They earned a peronal best for thier performance. Pang & Tong also gave a well skated performance. They scored within a few tenths of a point of Zhang & Zhang for both elements and Program Components. Though they attempted a program with slightly higher base value, they earned fewer element points than Zhang & Zhang, so in this case, the quality of the leaders trumped the difficulty of the challengers. Pang & Tong were also marked slightly lower in Program Components than Zhang & Zhang, as invariably proves the case for these two teams. 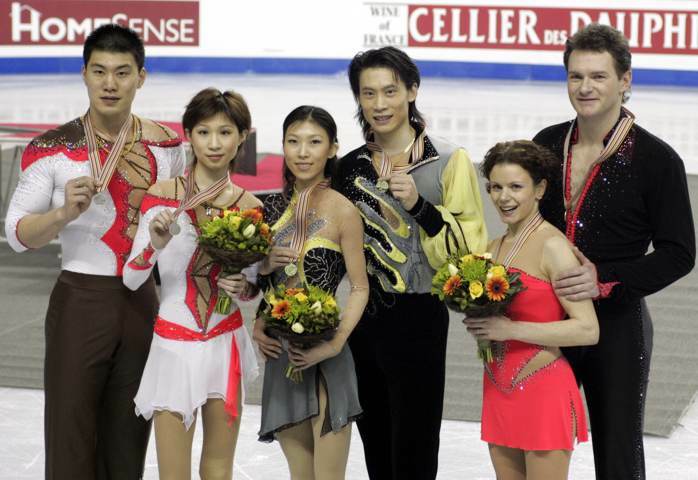 Although the top two teams are virtually tied, history says that unless Zhang & Zhang self destruct in the Free Skating, the positions of these two teams will not change. Maria Petrova & Alexei Tihkonov lie 2.51 points back behind the leaders, in third place. While competitive with the top two teams in Program Components, they were less so in elements, in large part due to a negative GoE on their throw triple loop versus the positive GoEs earned by the Chinese teams on their throws. Less than four tenths of a point behind the Russians, lie Valerie Marcoux & Craig Buntin, the Canadian champions. They had the third highest element scores, but came up short on Program Component scores. Their main weakness here are their presentation components. The lively sections of their program well skated, but the middle section misses the mark in terms of expressing the music and keeping the attention of the audience. The current U.S. Champions, Rena Inoue & John Baldwin sit in sixth place, 4.68 points behind the leaders, and 2.14 points outside of the medals. Though still mathematically in the running for a medal, their prospects are not encouraging. They landed throw triple Axel, but with GoEs of -1 from five of twelve judges. There main problem, however, is their Program Component marks in the mid 6s, where the top teams are at 7 and above. Since the judges seem to use the component marks to slot the skaters into the places they want, and given the fact the component marks don't change much from one program (or competition) to another, about the best this team can hope for is that a good skate in the Free Skate will move them into the top five. Commenting on their performance, Inoue said, "We practice all elements equally, but a lot ofpeople make a fuss about the throw triple Axel, because we are the first to do it. We kind of knew that it would be there, because it's been really consistent. I wasn't worrying about it. I was focusing more on the overall program and not one element. I think it owrked out pretty well. But our score wasn't too high, we were a little bit disappointed." Added Balwin, "Our goal here is to put two programs together with that Ael in it. Technically the program is going to be there for us. We just really want to get into the performance aspect of it and bring our second mark up as well. Our combinaciton spin was graded a level two, and usually it was a level four." Marcy Hinzmann & Aaron Parchem placed tenth, 12.72 points behind the leaders. They had a decent skate with typical Program Component marks of 6.0. The program was well performed with good expression and a nice forward inside death spiral and good unison on their straight line footwork. Their unison on their side-by-side spin was off, however, and received several negative GoEs, and their triple toe lops, which they both landed, had tight landing edges. Qing Pang & Jian Tong skated their "Phantom of the Opera" & "Music of the Night" by Andrew Lloyd Webber program right after their countrymen as the final competitors of the day. They also train with Bin Yao but their choreography was created by Sarah Kawahara. Their partnership began in 1993 when Yao put them together. side-by-side triple toe loops which was downgraded to a double in the scoring. Her partner added, "But only that mistake. The rest of the program, we performed all the other elements to our best." Their previous personal best score for the freeskate was 123.43 and was earned at the 2006 Winter Olympic Games. Tonight they raised that with a new personal best of 124.22 besting the Russians in that segment by just 1.04 points. The margin grew wider when both programs were combined, winning by 189.20 over their Chinese countrymen. "It was a good performance in spite of the mistake. We will continue to work hard, she said"
This team nearly split up earlier this season. "At the Grand Prix Final, we had a serious quarrel and thought about quitting. But then we communicated with each other and the (Chinese skating) Federation helped us and we worked very hard one month before the Olympic Games", Pang explained. This duo considers Canada a lucky country for them and their past results bears this out. Of today's medal Tong said, "I feel happiness. We stand on the top of the podium for the first time in this event. We belong to the medal contenders in each competition but we weren't always able to show our best. We can do much better in the future." They previously earned a bronze world championship medal in 2004. We had a mistake, but all our other elements were very good", Tong said. Now that they are the world champions, hopefully they will also work on some of their smaller details, such as her feet positions in the lifts, lengthening their lift airtime and getting lower on their backward outside death spiral. Their twist was very good, and their throws are outstanding. They did much better with the forward inside death spiral. Also from Harbin, China, the final competitors of this competition Dan Zhang & Hao Zhang performed to "The Offspring of Dragons" by Hou De Jian, a program choreographed by Renee Roca & Gorsha Sur. They did not improve on their personal best from the Olympic Games of 125.01 where they received the silver medal. They train with Bin Yao in Harbin, China and have been a team since 1997. Although they share a last name the two are not related. This team did not attempt the throw quad Salchow here. "We were tired, really tired," Hao Zhang said. "This competition was so close after the Olympic Games. Although we are in second place, we're very happy to see two Chinese couples in first and second today." Zhang said of their performances, "We did not perform as well as we did for the Olympic Games. We didn't feel any pressure after the short program. The short program is shorter, we could be more relaxed. You need more energy for the free skating. We didn't have enough energy and made mistakes in the second half of our program." They finished fourth in the free skate but their lead from the short program carried them into 2nd place overall. He fell on the side-by side triple Salchow and she doubled it. Their footwork sequence did not have their normal speed. Her knee was still an issue for her here. "It's indeed affected our performance. During training, I still have to bandage the knee and I have some pain. We are not in our best condition," said Don Zhang. Russia's Maria Petrova & Alexei Tikhonov improved on their 5th place Olympic finish and skated first of the top 4 teams for the long program. They returned to their 2000 World championship program of Winter from "Four Seasons" by Antonio Vivaldi, rather than perform their Olympic program again. He said, "We just wanted to skate (this) with our souls, for the audience, and for ourselves. We wanted to show our best skating from beginning to end and we love this music so much." They gave a strong, clean performance but finished second in the freeskate, but third overall. They lost the silver medal by just .20. All their elements were clean and well executed. Tikhonov said, "Maria and I always wanted to skate like Elena Berezhnaya &Anton Sikhuralidze or like Xue Shen & Hongbo Zhao in 2003 when they had this wonderful performance at the World Championships. Today we finally did it and it was incredible. This medal is like gold to me." Tikhonov said of their future, "Maria has an injury (ankle) as you know. Sometimes you have to stop and to start something new. In 1998 we had our first competition in Canada, in Kamploops (Skate Canada) and now we had our last competition here. When we came to the ice rink, we thought about the eight years of competing at the World Championships." He said earlier before the press conference, "I would like to stay one more season, but with her injury it is all her decision so we will see. We are probably finished and maybe we will be turning pro and teaching other young people to skate." They are the 2005 World silver medalists and won these championships in 2000. They previously earned a bronze medal at the 2003 World championships. Their countrymen 2005 World Champions & 2006 Gold medalists Tatiana Totmiania & Maxim Marinin opted not to compete at these World championships. Canadians Valerie Marcoux & Craig Buntin skated their "Our Song" by Paul Kunigis, who especially arranged this music for them for a very appreciative Canadian crowd. Today Marcoux fell on their double Axels but the rest of their program was clean. We made the one mistake on the Axel but, overall, it felt good out there," said Marcoux, "The crowd was amazing. We got a personal best, so what a great way to finish our season." Their previous personal best 116.48 took place at the 2005 Trophee Eric Bompard. They enjoyed the hometown crowd. "We're not going to see this much energy in a building probably until 2010," said Buntin. "We really learned a lot this time, and I think we're going to be much better skaters because of it." They train with Richard Gauthier & Manon Perron in St. Leonard, Quebec. Julie Brault choreographed this program. This pair teamed up in 2002 and have been with these coaches since the 2003-2004 season. They are the three-time Canadian national champions. Making the final group here is an accomplishment as they were 9th at the 2006 Olympic games and 11th for the 2005 World championships. "Bon Voyage" from "Oceanic" and "1492 - Conquest of Paradise" to finish seventh in the freeskate but 6th overall in their second trip to the world championships. His glitch on the triple toe loop landing and the step out on the double Axel later in the program were costly, earning them zero points. They executed a big throw triple Salchow. "I am a little weak on my toeloop and Aliona said she did not have any strength left. We lost our inner rhythm. We skated some programs in practice here that would have been good enough to medal here," said Szolkowy. Today's program earned 108.84 well below their personal best of 123.62 from the 2006 European Championships. Ingo Steuer coaches them in Chemnitz, Germany and also choreographs their programs. He is the 1997 World pair champion with his former partner Mandy Wotzel. This duo matched their 6th place finish at the Olympic Games & 2005 Worlds and are three time German national champions. They teamed up in 2003 and she moved from the Ukraine to Germany and she received German citizenship in January 2006. Americans Rena Inoue & John Baldwin lit up the ice with a strong performance. We skate like that at home," Baldwin said. "They key part is to put it out in competition. Definitely to get programs out like that at the world championships was very important." Their only error was Inoue's slight hand touch on their trademark throw triple Axel. Their side-by-side triple toe jumps were strong tonight and that set the tone for the rest of this program. "I tried to tie the throw triple Axel and the triple toe jumps together in John's mind for competition," said their coach, Peter Oppegard. They train with him since 2005 and he also creates their programs. Performing to music by Dmitri Shostakovich, this duo reached a new personal best of 122.27 for the free skating segment, finishing third in that event, but fourth overall. Although they were just off the medal stand, they and their coach were euphoric backstage about their skate and results. Their previous personal best came at the 2006 Winter Olympics with 113.74 points. "This stands out completely as the entire package with the short and long programs," Oppegard said. "We had a distinct plan coming in here and it involved two triple Axels and the triple toe." The two-time national champions and the 2006 4 continents champion were 7th at the 2006 Winter Olympics. They now go in the record books as the first team to land the throw triple Axel at both a world championship and an Olympic games. Level problems held them back in the short program, when elements that earned higher levels all season internationally were suddenly downgraded here. They were not about to let that happen in the freeskate. They made changes to their footwork sequence at Tuesday's practice, adding two more layers to their straightline step sequence to earn level 3. "We wanted to do whatever we could to get every point we could," Baldwin said. Inoue became a U.S. citizen in 2005 and the team is already thinking about next season. "We have a lot more that we want to accomplish in our skating," Inoue said when asked about retirement. "And I really feel like our team has a lot more to do. It's not like we've reached the top yet. It's very exciting to accomplish our goal every year." Her partner added, "I feel like our partnership is still in its infancy." The second U.S team of Marcy Hinzmann & Aaron Parchem who train in Detroit with Johnny Johns & Mitch Moyer finished 11th in their first trip to a world championships. They previously finished 13th at the Olympics. Early in their program Hinzmann took a hard tumble. "That is actually the first throw loop I have missed in probably two years in competition," Hinzmann said. "And since that is our second element that really kind of sets the tone for the program. Right after the throw triple loop is our side-by-side triple toes. So, me falling on that made us have to scramble into the next thing, which I think kind of rattled my confidence a little bit, and then I couldn't do the triple toe like I usually can." She added, "The throw (loop) was a little bit big, which I'm used to that, but I think I was a little bit forward and when I hit the toe I slipped right off the blade and onto my stomach." She also put her hand down on the throw triple Salchow today. been a really great thing to see how much both of us have come along in a short amount of time. Now we get to do some fun things like shows and seminars." This duo will sit down in May and decide their future for next season. Their personal best freeskate is still 2005 Skate America where they scored 99.30 The USA will keep two teams for next years worlds, but were two points short for three teams there. Canada's second team of Jessica Dube & Bryce Davison finished 7th, giving Canada three spots when combined with the other Canadian team's top 5 finish for the 2007 World Championships.